The Chicago-based publishing company for The Capital Gazette says it is “deeply saddened” by the attack on its Maryland newspaper. Police say five people are confirmed dead in Thursday’s shooting at the paper’s location in Annapolis, Maryland. Tronc Inc. publishes the Chicago Tribune and other newspapers and digital news sites in various markets. A leading government official for the Maryland county where the deadly shooting occurred says investigators still don’t have any information about a possible motive. Police have said the suspect in Thursday’s shooting at a Maryland newspaper is a white male now in custody who was armed with a long gun. Authorities say five people are confirmed dead and investigators are questioning the suspect. Anne Arundel County executive Steve Schuh says the suspect “has not been very forthcoming” with information. Schuh adds: “To my knowledge, there was no verbal aspect to the incident where he declared his motives or anything else, so at this point we just don’t know. Police have confirmed that the suspect in a deadly shooting at a Maryland newspaper is a white male who was armed with a long gun. He said the device “was taken care of,” but didn’t elaborate. He says authorities don’t believe there are any other explosives at the site. Frashure says police have no information yet on a motive for Thursday’s shooting, which left five people dead and others seriously wounded. President Donald Trump says his “thoughts and prayers” are with the victims of the shooting at a newspaper in Annapolis, Maryland, and their families. Trump says in a tweet that he was briefed on the shooting at The Capital Gazette before departing Wisconsin. A shooter killed five people and wounded others at the newspaper Thursday. Police say a suspect is in custody. A U.S. official briefed on the investigation has identified the suspect in a shooting at a Maryland newspaper as a white male who is believed to have carried a shotgun. The official told The Associated Press on Thursday that the suspect is not cooperating with investigators. The official wasn’t authorized to discuss the ongoing investigation publicly and spoke to the AP on condition of anonymity. The New York Police Department has deployed counterterrorism teams to news media organizations in response to the shooting at a newspaper in Annapolis, Maryland. Police presence was seen outside The New York Times, ABC News and Fox News early Thursday evening. Police say five people have been killed and several others were “gravely injured” in a shooting at a building housing a Maryland newspaper. A spokeswoman for the city of Annapolis, Maryland, says one suspect is in custody after a shooting at the building housing the Capital Gazette newspaper. Susan O’Brien shared the information with The Associated Press in an email Thursday afternoon. A spokeswoman for a hospital near the newspaper said two patients had arrived there but she did not know their conditions. Anne Arundel Medical Center spokeswoman Arminta Plater said she couldn’t immediately provide any further details. 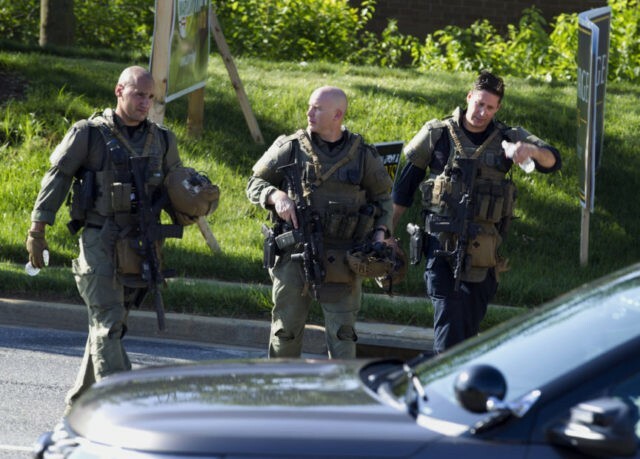 Police have confirmed an active shooter in the building housing a Maryland newspaper. Lt Ryan Frashure of Anne Arundel County Police said Thursday that “we did have” an active shooter in the building where The Capital Gazette is located, and there are injuries. He would not say whether a suspect was in custody, or give details about the extent of the victims’ injuries. He says police are first trying to make sure everyone in the building gets out safely and that there are no bombs inside. Phil Davis is a reporter at The Capital Gazette newspaper in Annapolis. He tweeted Thursday that a gunman shot through the office’s glass door. The Baltimore Sun, which owns The Capital Gazette newspaper in Annapolis says a reporter told them of the shooting Thursday afternoon.